Yielding far-reaching city views, this exceptionally generous top/third-floor flat, with three/four bedrooms, two bathrooms and two reception areas, lies in walking distance of Edinburgh city centre, within an exclusive development offering landscaped communal gardens and secure parking. Please note there is no lift in this property. Situated just 20-minutes’ walk from Edinburgh’s West End and enjoying far-reaching city views, this highly-desirable third-floor flat represents a wonderfully spacious home with three/four bedrooms, two bathrooms and two versatile reception areas. The flat forms part of a beautifully-landscaped development with charming shared gardens and secure parking, whilst the tasteful internal finish of the property is of a superior standard, with all living areas benefiting from a sunny southwest-facing aspect. Approached via a well-maintained communal stairwell to the top-floor, the flat opens into a large central hallway with useful storage. Here, crisp white décor, comfortable fitted carpeting and delicately-detailed ceiling coving create a welcoming introduction to the home. Echoing the hall’s impeccable decorative finish, the adjoining bay-fronted living room represents a superbly light and airy space for relaxation, with a generous, flexible floorspace for furniture. Next door, a formal dining room is presented with pastel-toned walls, with further elegant coving and practical timber-style flooring, and could easily be adapted to alternative uses such as a fourth bedroom. Adjoining the dining room is a sunny and spacious kitchen laid with characterful wood-effect flooring. This well-appointed space includes contemporary-style fitted cabinetry accompanied by ample workspace, an integrated fridge, a freezer, a dishwasher, an eye-level double oven, a gas hob and an extractor hood. A tall freestanding fridge freezer and a handy pantry store are also included. Across the hall lies an impressive master suite, a further good-sized double bedroom and a single bedroom, with all rooms heightened by tranquilly-toned décor, plush fitted carpeting and built-in wardrobes. Lit by twin windows and occupying an excellent footprint, the master bedroom also enjoys the luxury of an en-suite shower room. 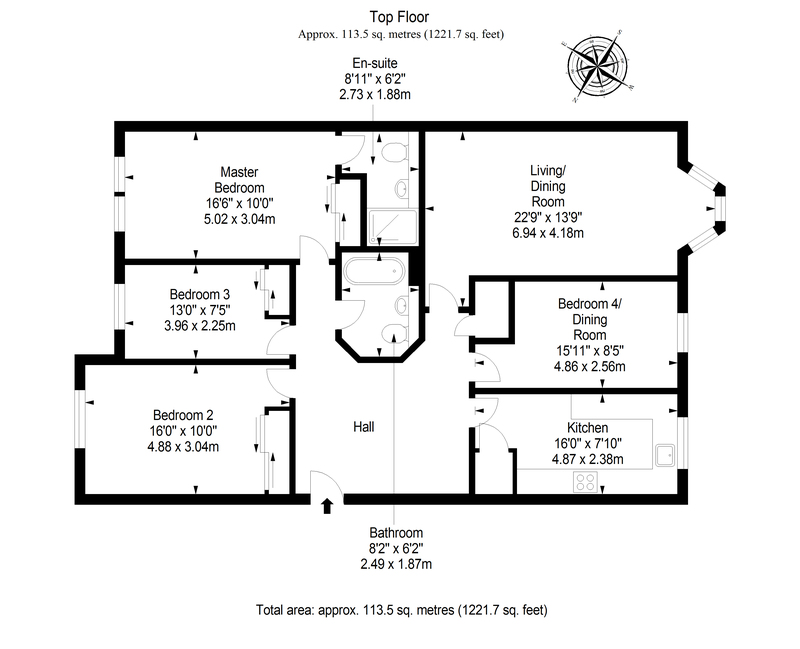 The remaining bedrooms are served by an attractively-tiled family bathroom comprising a WC-suite and a shower-over-bath. Finally, with ladder access from the hall, is an extensive floored attic space providing outstanding additional storage. Gas central heating and double glazing throughout ensure a warm, energy-efficient climate all year round. Externally, this sought-after city development includes well-maintained landscaped communal gardens, with neat lawned areas and mature planting. A private parking space can be found within a secure communal garage. Extras: All fitted floor coverings, light fittings, selected window coverings and fridge freezer to be included in the sale. Factor: The factor is managed by James Gibb at a cost of £60 a month.